Volume 13 | Bren-Tronics | Perpetual Power! Dual Port USB charging. Photo © Bren-Tronics. Q: It is always a pleasure to speak with Bren-Tronics. So since the last time we spoke about six months ago, generally speaking what’s new? Advanced rechargeable lithium ion batteries are being relied on more, and providing more and more energy. Fully qualified as per international military standards, Bren-Tronics rechargeable batteries are offering over 500 cycles and wide operational temperature range [-40°C; +80°C]. Permanent absolute state of capacity indicator provides reliable information for the users. 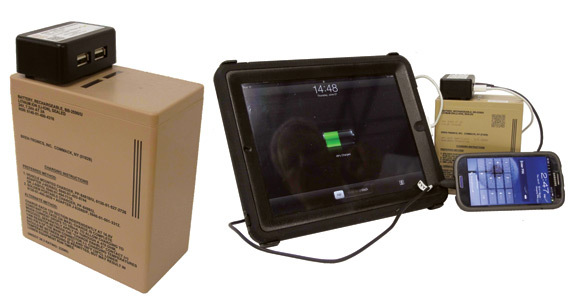 Bren-Tronics universal charger concept is the chosen solution by many new NATO Armies. The same platform is servicing all on-the-field deployed battery types. With over 100,000 products delivered worldwide, Bren-Tronics chargers are the most fielded in the world. Battery and charging logistics is being standardized. It is strongly reducing the overall deployment cost, especially for overseas operations. It significantly reduces the amount of containers to be shipped, as well as reduces the waste associated with throw-away batteries. Finally, versatile tactical modular power stations integrated with renewable power sources are increasingly being deployed. The same systems are currently used for multiple applications: radio-communication, electronic warfare, radar and ground surveillance, optronics, robots, lightning, training and simulation, etc. A: Based on warfighter inputs, Bren-Tronics introduced a variety of new products to lighten the warfighters burden as well as increase run times in the field. The FLEXTM charger is a light weight, foldable charger servicing 4 to 8 lithium ion rechargeable batteries. It takes any DC power sources and optimized solar charging. Different battery types can be mixed using the appropriate interface. We have also recently deployed the DUAL USB Charger, a 2 port USB cap compatible with any “X90” primary or rechargeable battery types. As we continue to follow our road map to achieve maximum capacity, we have upped the standard BB-2590/U energy from 225Wh, to very high capacity at 295Wh with an operational temperature range extended from -40°C up to +80°C. To ease procurement we have recently launched a new Buy-Online option on Bren-Tronics web site (www.bren-Tronics.com ) for the US market only. 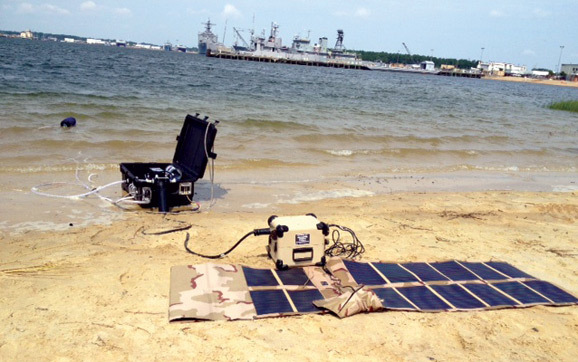 Q: Again, since last time we spoke, do you have a particular story or anecdote from the field where one of your portable power solutions really made the difference during a critical operation, or if not, just some general feedback you can share regarding some or your most recently deployed solutions? A: Our ULTRACELL “High Power Micro Fuel Cell”TM has been selected by various NATO Special Forces to provide long lasting power for extended mission duration. The combination of Direct Methanol Fuel Cell technology and very high capacity Li-Ion batteries leads to an optimized weight vs power system to supply over 36 hours mission duration. Easy to set-up, Bren-Tronics ULTRACELL power solutions successfully passed cold operation and storage test during Scandinavian exercises this past winter. Following a battery standardization rational process, Bren-Tronics successfully passed a large scale field test for Training and Simulation Target systems. The usage of Bren-Tronics’ BB-2590/U battery maximizes the duty cycle without changing any system parameters nor introducing a new item in the inventory. The addition of solar panels as a renewable energy source can provide unlimited operation. Q: With what you are at liberty to disclose of course, what new areas of R&D do you think Bren-Tronics will be moving into, or new product lines to be introduced over the next six months to a year? A: Bren-Tronics is following two directions in terms of new product development. 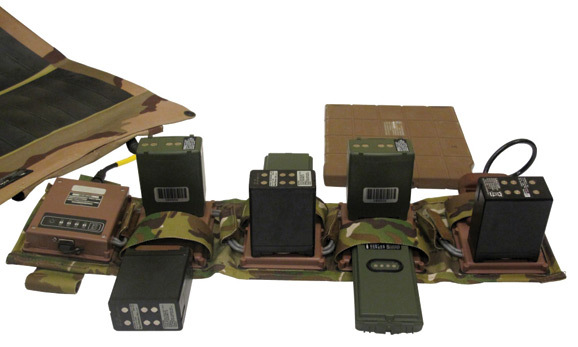 To reduce and optimize the power sources for our soldier system platform, Bren-Tronics is reducing the size and weight of the system, while maintaining a high energy capacity with easy to use power distribution. Solutions are based on renewable hybrid power sources, fuel cell integration and the latest lithium ion electrochemistry technology. We are also focusing on developing larger lithium based hybrid power stations to address forward operating base (FOB) power demands. The goal is to reduce the fuel consumption by introducing renewable power sources and high energy storage solutions. Solutions are based on large format lithium cells, solar technology and flex-fuel generators. Bren-Tronics continues to lead the way in cutting edge operational improvements to power the modern war fighter!